Assemblymember Jesse Gabriel (D-San Fernando Valley) today welcomed former Congresswoman Gabrielle Giffords to the State Capitol. 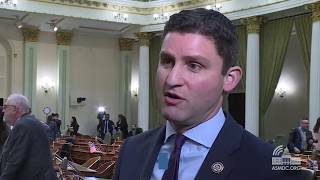 In a roundtable meeting with the Congresswoman, Assemblymember Gabriel and his colleagues discussed their efforts to craft a package of new laws to prevent mass shootings and reduce gun violence. 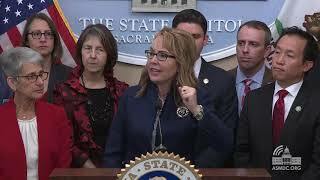 Congresswoman Giffords then joined Assemblymember Gabriel at a press conference, where he announced the formation of a new Gun Violence Prevention Working Group in the State Legislature. 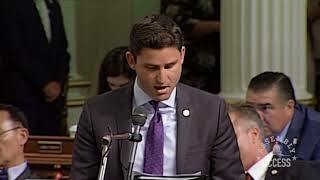 Assemblymember Gabriel also discussed his first two bills—Assembly Bills 165 and 166—which are sponsored by the Giffords Law Center to Prevent Gun Violence. 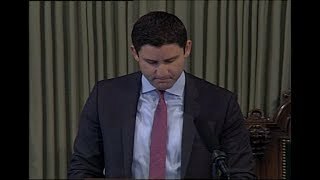 AB 165 would require the Commission on Peace Officers Standards and Training to develop and implement training for law enforcement officers on the use of Gun Violence Restraining Orders (GVROs). A GVRO is a judicial order that allows police officers to temporarily confiscate guns from, and prevent the purchase of new guns by, individuals who pose a significant risk of harm to themselves or others. However, GVROs have been underutilized since they were first introduced in 2016, and this training program would ensure that law enforcement officials throughout California are aware of when and how to use this powerful new tool. In addition to the Giffords Law Center, AB 165 is also supported by the Brady Campaign to Prevent Gun Violence and the California Statewide Law Enforcement Association. AB 166 would authorize Medi-Cal reimbursement for violence prevention services offered through hospital-based Violence Intervention Programs. These innovative programs have proven effective in reducing the cycle of gun violence in many communities, and expanding access to these services would help save lives and reduce the expenditure of state funds through the healthcare and justice systems. Both AB 165 and AB 166 are expected to be heard in Assembly policy committees in the coming weeks. 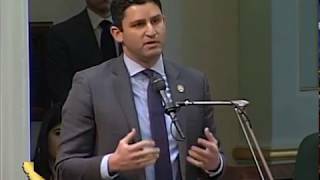 Assemblymember Gabriel is also working with his colleagues on a variety of additional gun violence measures which will be introduced in the coming weeks. 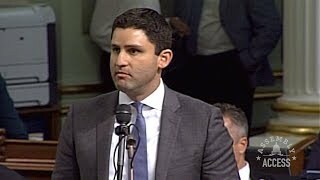 Jesse Gabriel serves in the Assembly Leadership as Assistant Majority Whip. 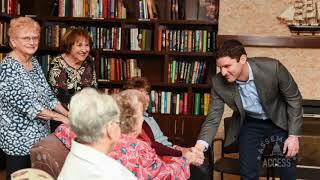 He represents the 45th Assembly District, which encompasses much of the west San Fernando Valley. Gabriel currently serves on the Committees on Appropriations, Housing and Community Development, Higher Education, Banking and Finance, and Privacy and Consumer Protection.